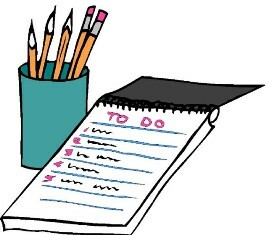 To do lists are a must. I never start my day without one. Good post on time management. I guess my dilemma is that I’m not a SAHM anymore. When I was, and ran my own business, taking care of the kids and household was just part of my day (it helped that my home biz was a daycare). Now that I am working outside of the home, with a long commute, I never see my kids, I still need more money, and housework is absolutely on the bottom of my list. I have started using Remember The Milk for both home and work, it syncs with my phone, but I am, and always have been, good at ignoring my lists. I get overwhelmed way too easily. O.K., done whining on your blog. Thanks, Dawn. .-= Annette´s last blog ..Fresh and Easy =-. Dawn, you are an organizational goddess! I need to get better about keeping a list of things. I know it’s better to get all the thoughts out of your head and onto paper, but I find myself so busy that I never do it. Writing it down would be so much more helpful. I have gotten a notebook and labeled its sections for various parts of my life – I just have to get into the habit of using it! .-= Mary@Everyday Baby Steps´s last blog ..Quick Summer Hair Care Tips =-. This is a great post! I am looking for ways to better keep track of my to-dos and this might work. Thanks for sharing! .-= Laura´s last blog ..Momma Cooks Monday – Cheesy Chicken & Broccoli Bake =-. Great Tips! I do a very similar list in my Busy Body Book – a calendar for busy mama’s like us! Which I will be writing a review within the next couple of weeks. Thanks again for sharing what you do 🙂 enjoyed reading it! .-= Brandy´s last blog ..Email and 400 Bad Request Errors =-. WoW Dawn, I am truly impressed!!! I’m tired just reading it! I learned this trick way back when I was working in an office, now that I’m at home all the time, disabled, people think I have all the time in the world. I do however have several doctors appts. that I have to keep, and I am not always feeling very well. Plus, my medication can make me sleepy and forgetful, plus I suffer from anxiety and depression, so I can lose track for things quite easily. I keep what used to be known as a “tickler file”. I keep it in a journal, I write down things that need to be done, how far I’ve gotten on them (things like fighting with health insurance companies often take SEVERAL phone calls and detailed notes), with dates and times. Then when something is finished, it is crossed off. When a page is completely finished, like you I put a diagonal line through it. It really offers a sense of accomplishment when you cross something off your list, makes you feel good! .-= Lorie Shewbridge´s last blog ..MY FIRST AWARD – YIPPEE!!! =-. I agree that this is a great post! I keep only one to do list. It will be better management to break it down to a few lists. I’ll give it a go, thanks! .-= Kim Bennett´s last blog ..Christmas in July Seminar with Brenda Stewart =-. But for the most part I use Google Tasks which does sync to my iPhone. I actually wrote a post about using it over on Type-A Mom. I just can’t even seem to get enough things checked off. If I check off 1, 3 more get added. I will take this as an inspiration. Maybe if I organize my lists this way, I can get more done! .-= Kris Cain´s last blog ..Well, well, well.. ATT did have Apple pull GV Mobile =-. oh my goodness, how do you get so much done with 3+ little ones?! To-Do lists help me as well. I feel so accomplished when I can cross those tasks OFF! I like the idea of separate lists. I also run multiple businesses from home– this would help me prioritize my time much better. Sound like I’ve just found the solution to my main problem at present – lack of time!